Nissan has released many firmware updates for the electrically-driven intelligent brake control module in different models of the Nissan Leaf. Some of these updates relate to improved performance and others to safety. Unfortunately, in New Zealand the majority of these updates have not been made available by Nissan New Zealand to their franchised dealers. We are now aware of several cases in New Zealand of brake failure occurring on AZE0-1xxxxx (2014/2015MY) Leafs. Fortunately, none of these events have led to accidents, but some have been close and many drivers have been quite upset afterwards. All vehicles were JDM models which were not running the latest available brake firmware at the time of the incident. Following an inspection of many of these vehicles after the event, we concluded that the evidence suggested a firmware problem rather than a mechanical or electrical problem. We do have some evidence that suggests that Nissan’s latest brake firmware updates may resolve this rare issue, but we have not yet been able to confirmed for sure. What is clear is that the firmware updates brings all 2013-2016 Leaf brake control modules up to later specifications beyond when any of these cars were actually built. Particularly in ZE0 (2011/2012MY) and AZE0-0xxxxx (2013MY) models, an update is reported by Nissan to improve the overall brake sensitivity at low speed. Some owners of 2014-2016MY cars have also reported improved brake performance and feel following the update and we have experienced this ourselves in some cases. Between this and the chance of resolving a potential safety issue, we currently recommend that anyone with an Leaf built before Feb 2016 is best advised to have the relevant brake update performed if it is available to them. 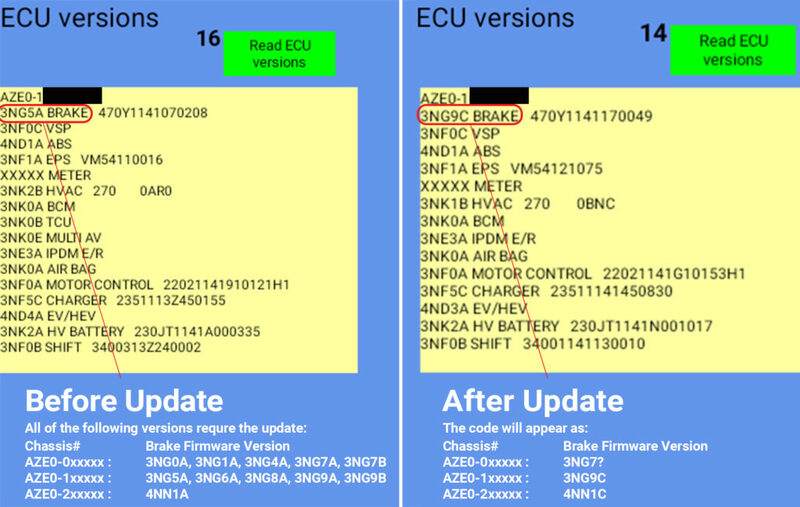 The graphic below shows the firmware versions to check if a car requires an update or not. This information is available on many diagnostics tools including the Pro version of LeafSpy. We already have the ability to perform these updates, but we take no satisfaction in knowing that currently Nissan NZ has not yet offered the full range of available updates to their dealers. With the number of imported Leafs in NZ, any successful update campaign will need to be distributed to be able to cover all of our cities and regions within any reasonable length of time. Nissan’s existing dealer network is the obvious choice to be utilised for completing this work, so we are hoping they will eventually step up to deliver this service. In the mean time, we will continue to try to support owners of imported Leafs as well as we possibly can.